The OAL Dance Festival of Arts and Culture will be held Friday, June 17, 2011 at 21.00 in the tent at the city's fairgrounds in San Pedro Alcantara. Rumba, paso dobles, sevillanas, Cadiz tanguillos, bulerías, malagueñas and even an Argentine tango can be seen at the Dance Festival organized by the city of Marbella, through the delegation of Culture and Education and Dance Workshop of the Autonomous Local (OAL) Art and Culture in San Pedro Alcántara. Admission is free. The dance teacher of this workshop, Pepi del Río, has worked with students for a year teaching then classical Spanish dance as well as the use of castanets with dance. This event is a memorable Senior Year which will include more than 70 people. This festival is celebrated to mark the completion of the course, which has taught dance to 9 groups of about 15 people each. The dances are divided into several levels. The beginners will be performing Sevillanas and Rumbas. The Intermediates perform tanguillos, fandangos and malagueñas and the Advanced Level perform bulerías, alegrías and zapateado (advanced footwork). 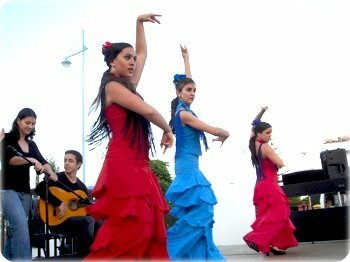 This is a great opportunity to see a flamenco performance for free, performed by locals.